I’ve had a number of blog visitors ask about training spots in Epcot. Epcot offers more training meets than the other parks by far. There are a large variety of locations that I’ve personally witnessed character training including behind Innoventions near Journey in Imagination, the Fountain of Nations stage area and the International Gateway. 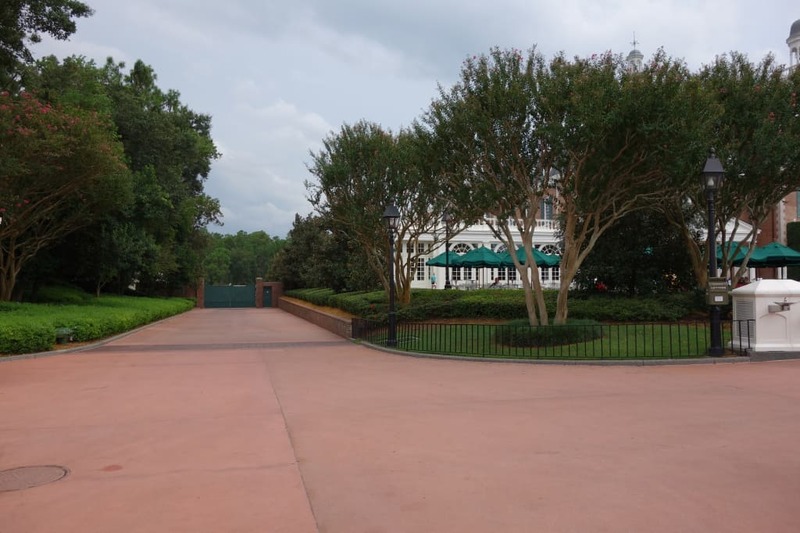 But the two most commonly used training areas are the World Showplace gates between Canada and the United Kingdom pavilions and the American Adventure gates to the immediate left of the attraction. The best times to see rare characters are times near marathons, when the Disney College Program begins its new sessions, and the week before Halloween and Christmas parties begin. At various training locations, My kids and I have seen Ariel, Belle, Big Al, Chip n Dale, Donald, Eeyore, Foulfellow, Gepetto, Goofy, Jiminy Cricket, Mary Poppins, Mickey, Minnie, Mr. Penguin, Mr. Smee, Pinocchio, Pluto, Queen Grimhilde, Rafiki and Rosetta. Some characters that we didn’t have a chance to meet in Epcot, but have appeared there for random or training include: Captain Jack, Cruella, Dr. Facilier, Gaston, Jane, Mad Hatter, Max, Megara, Merida, Rapunzel and Flynn, Shang, Tarzan, Tremaine Family and Wendy. I’m sure there are many more, but I can’t think of them all. A Cast Member friend of mine thought it might be helpful if I shared which characters might appear at the World Showplace or American Adventure meets on a semi-regular basis. While the list may not be exhaustive, it gives you an idea of where you might find the characters below and how often on a 1 to 5 scale you might see them. Here’s some additions that another CM friend sent me. The person said the ranking best applies to times when College Program cast are training. We were in Epcot during the Flower and Garden Festival at the end of March and got to see Mickey and Goofy next to American Adventure! I wasn’t even aware of the character training, but we were in the right place at the right time while my 2 year old was napping. In Epcot, Canada area, Sept. 4 at 3pm, suddenly the doors open and out walk Eeyore, Chip n Dale, Donald, Pluto, Mickey, Baloo, and King Louie! I couldn’t believe it, we (and my daughter) were thrilled! Pingback: How to Maximize your Epcot Characters Experience in under 2 hours. Kenny, there have been sightings of the same characters that appear at the training at the hotels. Baloo, Big Al, Mickey, Goofy, Gideon, Foulfellow etc. have appeard at port orleans and animal kingdom lodge at mid-day when everyone is at the park. Is the Character training have a schedule? Can I find it in your character locator app? Schedules vary daily at Epcot Training locations. Could be training or none at all. 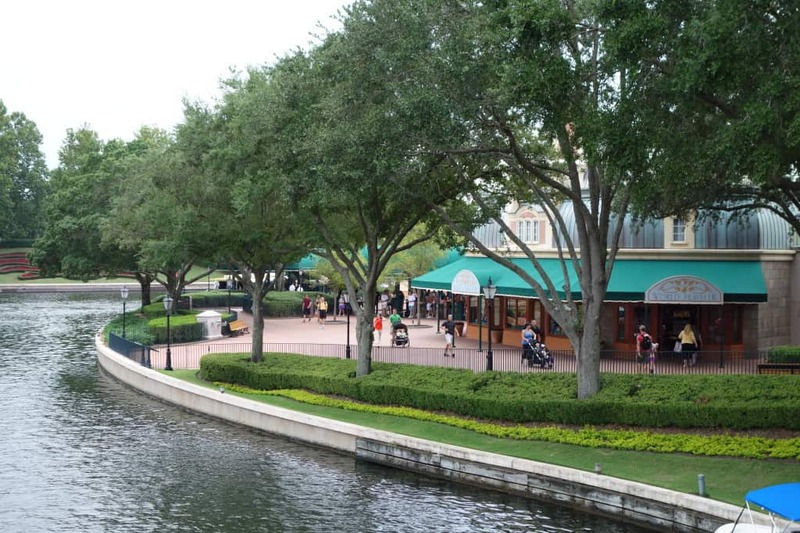 On a totally unrelated note, how long would one spend in each pavilion in World Showcase? We love seeing all the characters and we want to explore, but we have to fit Epcot into one day. At Epcot now & randomly found the Character training. Launchpad McQuack was there, along Balou, and some Country Bear jamboree guys. Pooh, Pluto, Goofy. If you go to Epcot or HS on a day they’re doing it and ask a cast member if and when there will be a character Palooza will they tell you? or is it supposed to be a secret? We will be going March 5, will you have a schedule posted before then? I’ll never have an Epcot training schedule because there isn’t one. They move about and use various times and locations. Thanks for all the info. I do have one question. When you say it is random do you mean the tomes of the days? Like, is this something that happens every day just at random time and places? Random. Happens often. No set schedule. No set days of the week. You were right on with characterpalooza today at HS. Queen Grimhilde and Bert amongst others were amazing! Normally starts around Noon for American Adventure area, if they are going to do it. Thanks Kenny for the tips. We caught Gideon, King Louie, Baloo, Smee, Mickey, Minnie, Donald, Goofy, Daisy, Pluto, Chip & Dale, Pooh, Meeko, Stich and Mr. Penguin between both World Showcase Pavilion and America today (1/9) and yesterday (1/8). It was pretty amazing! I was at epcot on Sunday the 6th and the shop (stand) right next to the gates recorded br’er fox, liverlips, and rafiki at 12 pm. I arrived at 1 so i missed it. Then, I stayed there until 1:40ish and left the park. 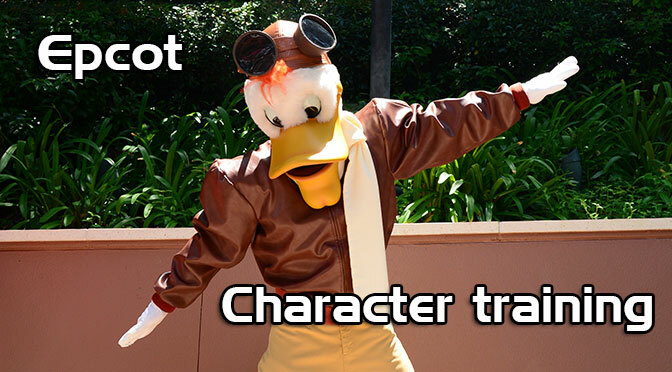 Do you know whether there will be character training during Food & Wine Fest? Specifically, I am taking my little girl to Epcot on 10/15 in the morning, and then to MNSSHP that evening. She’s only 3 and loves the characters. Thanks! EPCOT training today at Canada/UK gate: King Louie, Baloo, Max, Pluto, Donald. Rapunzel and Cpt Hook at International gateway. Multiple sets an hour apart. I mnwi some CM don’t know about Character Palooza but do most CM know about the training? Like if I asked a cast member do you think they would know? And is there a photo pass photographer at the training? Does character training occur as often as almost every day if you are looking in the right spot? Or would you say that frequency wise, it is closer to once a week or once/twice a month or so? I couldn’t thank you enough for everything you do for this site and characterlocator.com; you made planning my trip a breeze! Everything from the character’s exact meeting times to the cute maps you made of each park are so incredibly helpful. Thank you so much for everything you do! I’d say it happens most days, but less likely on weekends. How does it work ? Do you line up for each one individually or just one line and meet them all. 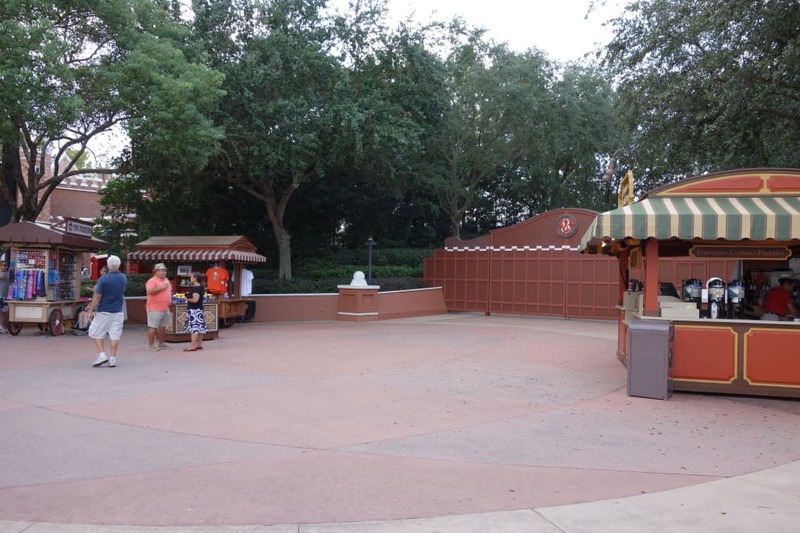 Will there be any Character Training at EPCOT any time soon? Would a CM that day know the times? No, they don’t release training schedules. You’ll just have to keep your eyes open, sorry. Do any of these experiences come at a certain, specific time? Character Palooza at DHS comes at a pretty set time…just wondering if the same thing can be said about these training sessions? Thanks in advance. Randomly between 11 and 5 daily in a variety of locations. Is training usually crowded and how long(approx.). Also, are the wait times for meeting any character long? I’ve created a bit of a schedule for my trip and I’ve listed the wait times for meeting characters as 15mins. Will they be much longer or shorter than this? Also, Marie from the aristocats is my favorite character since I can remember. Is she still available for meet and greets? And Also(again, I know, sorry), I’m getting two pillowcases signed by as many characters as I can, will they be able to do a legible signature/quote with a fabric marker(same width as a pen)? No, usually 20-30 minutes per set when it occurs. No. No line would take 15 minutes, but you can’t schedule this because it occurs randomly. Shaker is a great find at World Showplace! Successful training meet between CanAda & UK this morning at 11. Sounds like a fun meet and greet! Are their usually several training meets in January or February? Also, do really rare characters like Megara or Jane ever come out during these meets anymore? Oh, also, I’d just like to thank you for creating this site, I just got back from my first trip to Disney and it would never have been as eventful as it was without this site. I got to meet every princess(in 3 days) and several other characters and I even participated in a character palooza and was glad to see Pinocchio, the Evil Queen, and Pocahontas there along with Minnie, Donald, Aladdin, and Tiana. Training meets happen all the time. Jane is likely in August through September. Megara was only out because she was training for the Villains events. Glad you had a great time! We will be in Epcot on Wednesday. When and where night we catch this. I tried in October last year and was unsuccessful. I really don’t want to miss out again, so any information you might have would be great! Does this run during daylight savings time? I know Characterpalooza doesn’t so I was hoping maybe to see some rare characters during the winter in Epcot instead. Also are there any official times for the meets or do you just have to keep an eye out? Launchpad is by Canada today. Just finished his first set. Heads up. On your way there, I see? Glad you made it! Saw you entering as I was leaving. Went to his first three sets and was so excited every single time. Many thanks for trying to let me know! I got to hang out with Max and Suzy when I was on the College Program, and in the training group was Darkwing Duck! That was a highlight for all of us. I know we trained at the Hat as well at Hollywood Studios, and it was cute watching Goofy and Max together. Mickey, Donald, Pluto, Goofy, Chip, Dale, Tigger, Eeyore, and Mr Penguin were at the American Pavilion location today and Dopey was at International Gateway. Expect more CPs and MNSSHP training in the next few days. No problem! And Barbossa is out right now at the Gateway. Kenny, is it true that the world showplace training is around 11 and the American adventure training is around 2:30? Not necessarily. It depends daily on where they appear and the times they appear. Today at world showplace i saw smee, penguin, mickey, Minnie, Donald, daisy, chip, and dale then later in the day i saw characters in there again but couldn’t get a good view, do you think it was the same set or a different set? What time of day did you spot the characters? What are the days and times of these Epcot training meets? Wouldn’t it be awesome if they let you make a list of the characters you want to see at epcot training or characterpalooza, or if they let you do a vote on the characters you want the next time you go? What is the maximum amount of characters they bring? I am going to be at WDW for Memorial Day Weekend. Do you know if there is a chance of seeing some characters at these training spots around that time of the year? Could happen any day, could happen not at all. There’s no way of knowing in advance. I’m going in May. Can you still find jiminy cricket randomly at American Adventure? -Max by himself in front of American Adventure. Line was closed when I passed the first time but I managed to catch him a few hours later. Thanks again for the tips! I love Max and I was thrilled to finally catch him. Foulfellow was a GREAT find. He’s the most rare of that group. Today I saw TinkerBell at International Gateway, Belle (in her yellow ball gown) at Imagination and Pluto at the American adventure. Tink did at least 3 sets, while Belle and Pluto both did at least 2 sets. When we were there in Sept. 2013 (20th I believe), after the Synergy in Motion class, we were walking back from Figment to the main gate and ran into a Cinderella walking through the park with a CM, but no PP Photographer, but the CM was willing to take pictures. I would say about 11 am. We also ran into a Chip n Dale outside in Mickey/Minni building meet and great area, a few hours later. I would say it was around 1-2 pm. Were these possible Trainings or regular happenings. Chip n Dale meet outside innoventions every day, they are on my schedules. Click Characters > Epcot. We went January 2013 and happened to run into one of these in the American Adventure area. We had no idea what it was of course, but we saw a ton of characters. Baloo, Goofy, Mickey, Pluto, Eeyore, Donald, Rafiki, and more. We got to see almost all of them but a couple, and the lines were so short because it was a surprise. Such a treat! Thanks for the info. We will be going again early 2014 and I will be on the lookout for some character training in Epcot :) Our 4 year loves the characters and still believes they are real. So fun! Is there anywhere to meet Meg? Is there a certain time for when they open the World Showplace doors? And what time does the character training in America start? Leaving to WDW on Thursday. DD is a huge fan of the princesses and will be turning 13 while on the trip. We will be in Epcot on July 19. Any chance we could see training with princesses, preferably Rapunzel or Tiana? We will be visiting MK the next day and HS the day after, so if we don’t see those characters at Epcot, can we see them at MK or HS? Thanks! No one knows the training schedules. If you meet them it might be near Imagination or International Gateway, but your best chances are Tiana early at MK and Fastpass Rapunzel. What characters come out at International Gateway? And do you know where the characters come out from over there? No set list, but usually a training spot for face characters. On the little hill before you get to the gates. They are very visible when training there. At the World Showplace, do cast members just open the gates and guests can walk in and meet characters? Or is it something different? Just open gates and allow guests in for a few minutes to meet characters. Nope. Only certain character people know in advance and they won’t tell. do you think these still apply in 2013? im going in august and i love rare characters! Yes, it was just updated recently. How do you come about entering one of these training sessions? Thanks, but I just wanted to know how you would be selected to be in the character meets. Meg is very occasionally at the International Gateway. I was in Disney World in June 2012. On June 29, 2012 I was wandering around Epcot and came past the Word ShowPlace. I ran into and met Mr. Smee, Max, Pluto and the Country Bears: Wendell, Big Al, Shaker and Liverlips. From my trip a few weeks ago and with the help from taking with CMs me and my sis were able to experience this. Even though we didn’t find any extremely rare characters for us the more rare for Terk. Overall I still had fun with the characters and they all did a great job interacting!!!! Hope to experience this again and maybe hope that luck is on my side and get a rare character or two.